On a soggy morning in central London, a gleaming new public sculpture lit up Trafalgar Square. Even in pouring rain, the colours of Michael Rakowitz’s The Invisible Enemy Should Not Exist shone from the Fourth Plinth, the platform that has become the city’s most prominent space for contemporary art. 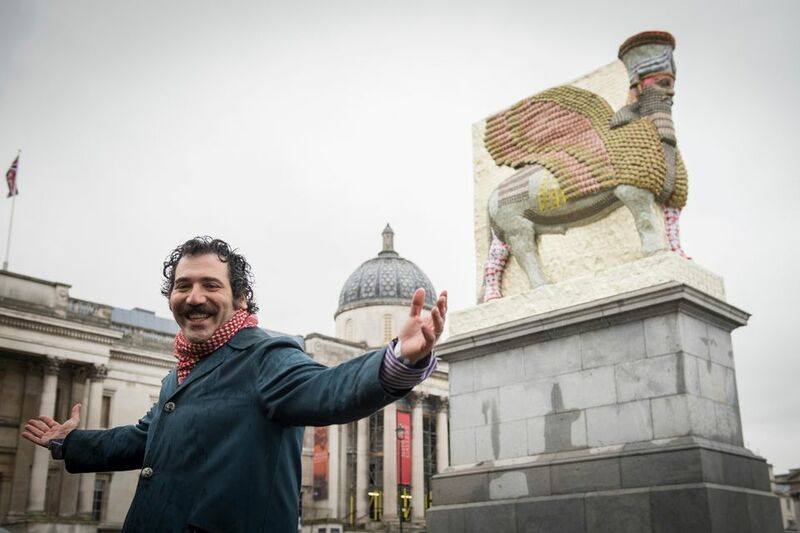 The work recreates an Assyrian winged bull with a human head, known as a lamassu, created in the ancient Mesopotamian city of Nineveh in 700 BCE but destroyed by Islamic State in 2015. It wears what the artist has called an “armour” of colourful date syrup cans, which Rakowitz has worked with for many years and identified as a symbol of the Iraqi people and the refugees that have fled the country in recent years—dates are to Iraq what cigars are to Cuba, he has said. Speaking in an extended interview for The Art Newspaper podcast last week, Rakowitz highlighted the “ultimate dehumanisation of the Iraqi people and its culture from 2003 onwards” and the “tendency towards thinking that anything can be replicated as long as you 3D scan it. [But] you can’t 3D print the people who lose their lives along with the cultural heritage that suffers”. The man who pulled the cord to release the winged creature from beneath its black veil was the Mayor of London, Sadiq Khan, who told the small, rain-sodden crowd: “We’ve surpassed ourselves this time.” He said 20 million people would see the work in two years. Khan has been an outspoken critic of the nationalist rhetoric that contributed to Britain’s Brexit vote in 2016, and clearly sees Rakowitz’s work as a symbol of his post-referendum London Is Open campaign. Rakowitz’s work will be on show in Trafalgar Square until March 2020.